We were attending a Fleetwood stern trawler ashore on the east side o Burray in the early 1970s. Later that day the "Hildona" arrived hauling creels in the area to find the trawler was on top of his back rope so they hauled to the hull of the trawler shot the rope again then went to the other end and hauled again until they came up to the vessel and returned the creels to the same place, saying "ach weel git them back when the trawler comes off". Would that have been Billy Rendall? I mind the guy to be very laid back about it all. If that was Billy Rendall, Ruby Rendall's uncle, he was a laid back guy right enough John. Will always remember him and his bonnie peedie Shetland collie dog named after a dram. In the 70's the surname would have been Rendall. Was the boat not named after his daughters Rhona and Hilda? Was the collie's name Brandy? I remember the family well. Robin , Billy's wife was Head teacher at the Holm primary at the time. Billy would take all manner o beasties ashore for us school bairns to study. Great times. 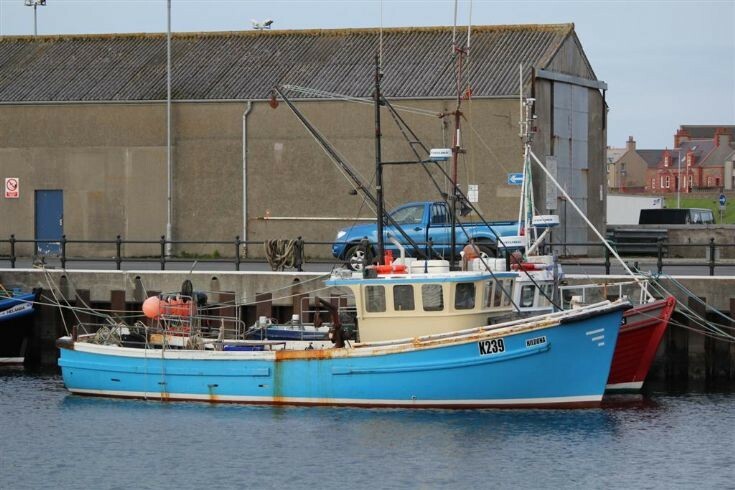 She was the first Halmatic 36' built at Hatston in the early 70s - a bit of Orkney shellfishing history. Generally reckoned to be very strong & able boats - design allegedly based on wooden clinker boats of similar size produced by the Duncan family in Burray. Later versions "Gangwarily", "Corilda II" and numerous others had watertight decks and some even fitted out as small trawlers or Scallop dredgers. It was believed that the Orkney operation was at a disadvantage compared to others like Cygnus due to transport costs and our remote location but the fact that most of them are still going strong after nearly 40 years proves Pierce Webb and his men did a good job originally.